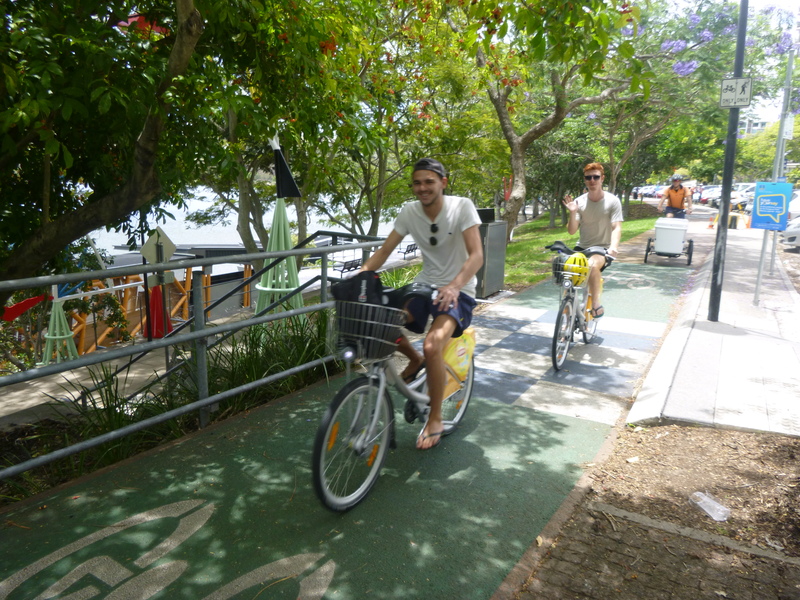 In November, Council released a preliminary design for Stage 1A and 1C of the Kangaroo Point Bikeway. Stage 1A will create a new four metre wide bi-directional bikeway that extends for 320m along Lower River Terrace and Dock St from the end of the Veloway to Little Dock St. The good news it that this will address the area behind the Maritime Museum where both the bike path and footpath are unreasonably narrow; plus the section along Lower River Terrace where people who have parked their car often walk along the bikeway instead of the (narrow) footpath on the upper level. But while it’s positive that the existing 2m wide path along Lower River Terrace will be widened to 4m, it is disappointing that this will come at the expense of trees and green space rather than parking. 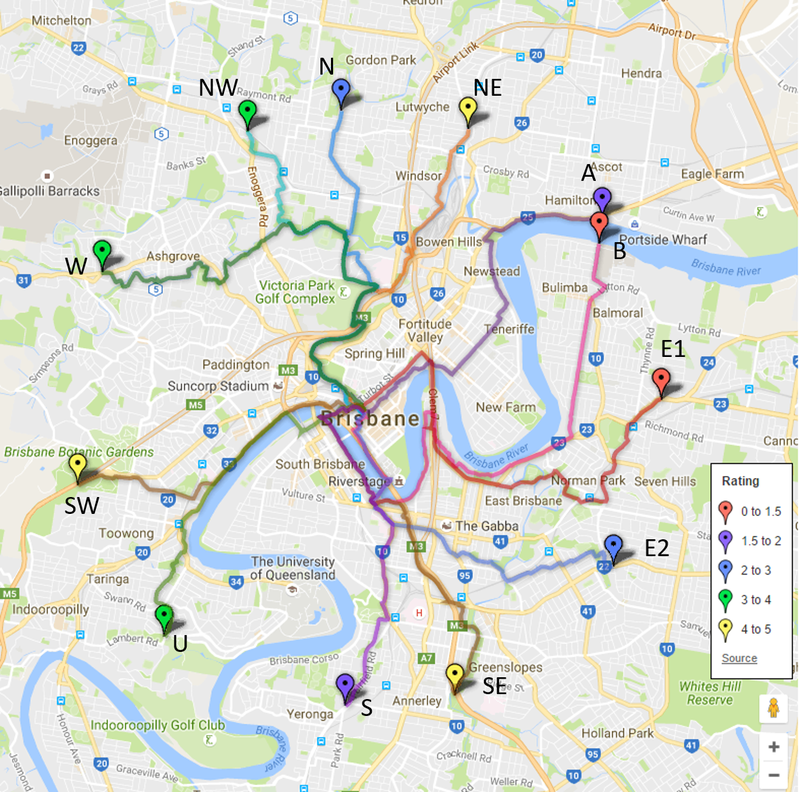 It is also frustrating to hear this promoted as providing a separated bikeway all the way from the Goodwill Bridge to the start of the Veloway under the Captain Cook Bridge, when under the current plan it actually increases the distance that people on bikes will have to ride on the road with cars and delivery trucks. 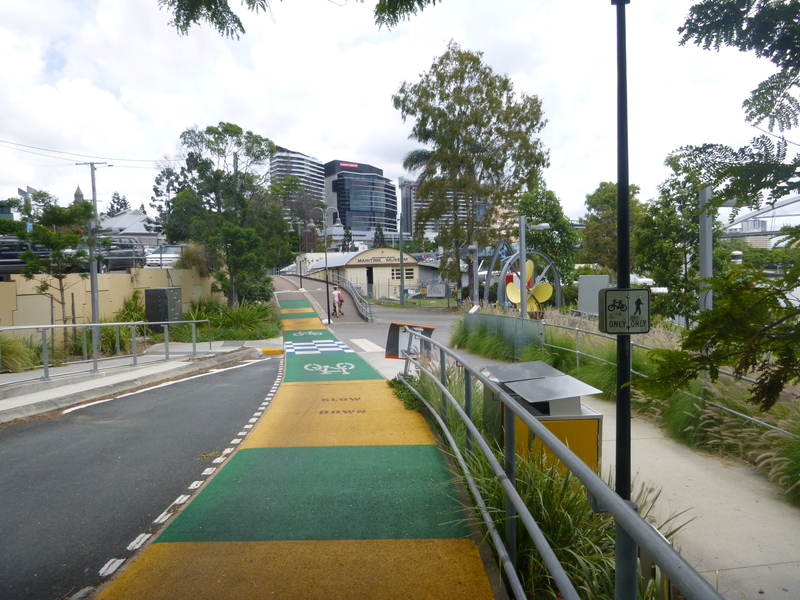 People heading to the Veloway or the eastern suburbs via Kangaroo Point peninsula will no longer be able to escape the road opposite Griffith Uni, but will have to keep riding up the hill to the end of Little Dock St in traffic. 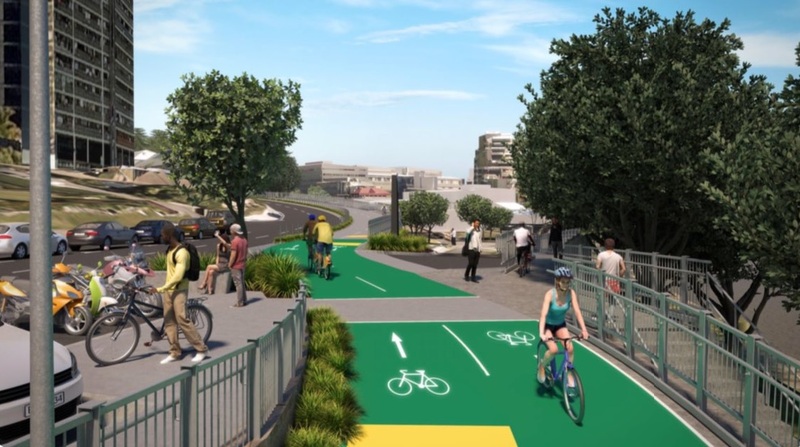 The current plans show that although the crossing over Lower River Terrace will be on a raised platform, cars will still have priority – which is unsuitable where a major bikeway crosses a minor local road. Lower River Terrace at this point services only carparks along the bottom of the cliffs, the driveway to the Riverlife function centre, a small number of residences along Lower River Terrace and Ellis St, and a rat-run from Leopard St which is used by impatient drivers wanting to avoid Vulture St and Stanley St. Stage 1C will upgrade the intersection at Vulture Street and Dock Street. This appears to involve increasing the size of the triangular island, but falls well short of making a suitable connection to the Woolloongabba Bikeway given the likely dramatic increase in cycle traffic using this side of Stanley St. Pedestrians and cyclists will still need to weave between each other at the intersection, wait twice to cross, and be funneled onto the totally inadequate shared path to reach Little Dock St.
Once again, this change seems to come by sacrificing a section of open green space on the corner of Dock St and Vulture St, in order to keep a left turn slip lane for drivers. Stage 1B – which is intended to address Little Dock St itself is still “subject to further investigation and consultation”. This is clearly an unsatisfactory solution, as it is this link that will determine if the Stanley St connection, and the route to the Veloway is indeed suitable for 8-80 cycling. 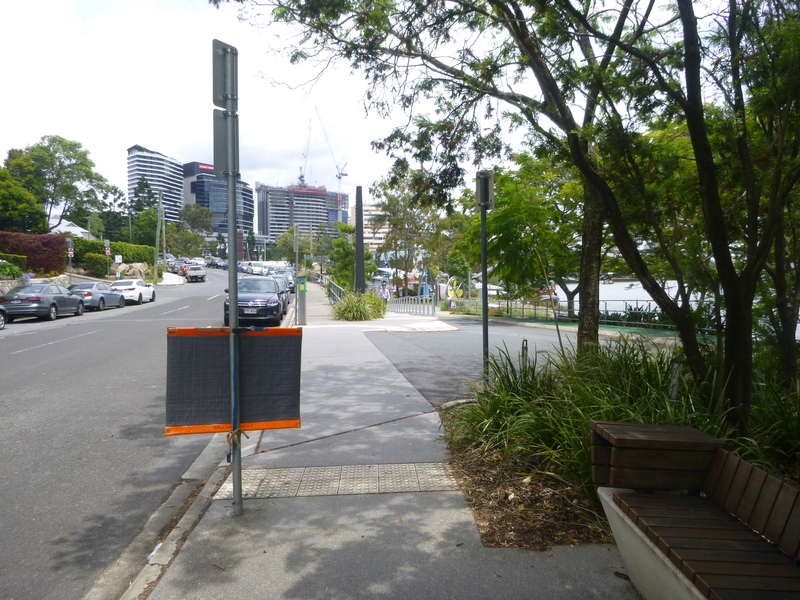 Council have said they need to negotiate with Southbank Corporation regarding the path next to Griffith Uni (which is on the land which was previously Stanley St), or any changes to the arbor path. We feel these negotiations and decisions should have been made first before proceeding with a section of bikeway which may not connect in a useful way to the next stage. Council has allocated $4,470,000 over the 2016-17 and 2017-18 budgets to this project, and we understand this is being matched by the state government (although there have been some conflicting figures stated for the overall project cost). For this investment, we consider it imperative that the project adequately address the intersections and conflict points. More information is available at Council’s website.